And so my fellow readers, this is why I've not blogged about my 2016 on time. 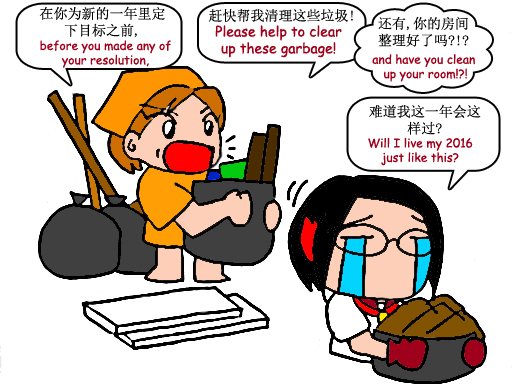 It's a long holiday so le Mom decided to do a house cleaning, to discharge those old items, to prepare for CNY. Back to the topic. 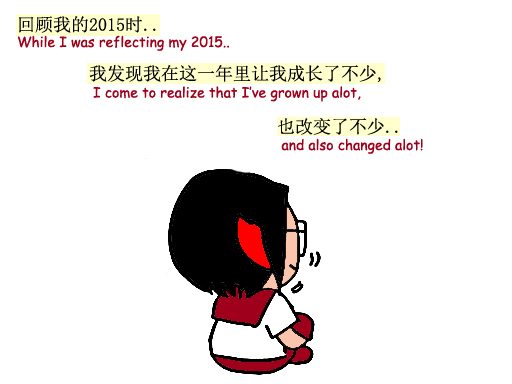 I realize I have not done my 2015 reflect. Hence, this post shall summarize all my thoughts on 2015, my hopes and dreams for 2016. It'll be long-winged post although I do admit that I'm a horrible written. Unless you're only interested about my comics, you are feel free to scroll all the way down to the comment section and just concentrate on the last paragraph I wrote. If I would to describe my 2015, it will be mentality transformation. This is the year where I began to understand about myself, how immature I was and how much confident I'm lacking. Admittedly, there were lots of things I judged quickly, impatient, non-aggressive, whatever you can name it. But God is good! HE used HIS mighty power to show it to me the areas to improve, what I'm lacking, and manage tamed me down within 3 months! This is something I didn't expect it turn out to be, based on the 2015 Resolution I made back then. I can proudly say that I'm much happier and calmer than before, although there's still room to improve. Feel so happy to hear from my friends that I look much better and brighter than before lolol. And I stopped falling sick ever since July 2015!!! WOHOO!!!! My biggest transition is surely changing job. From the position I've been so used to, comes down to that level, adapting to a whole new environment with different culture and colleagues, I must admit it takes quite long time for me to settle down. However, God has been good to me yet again, despite the circumstances. As for blogging, it has been an interesting 2015 for my dear bloggie. For the first time after 7 years of blogging, I'd my first food review!!! *dance with joy* And many events/invitations just come to me. For this, I've to give credit to Angel. Without her suggestions and advices, I probably still moaning about how boring my blog can be, and not being able to meet some cool blog friends. 1. Learn to think a bigger picture. - Maybe I'm about to enter that kind of stage, I find myself no longer look what's happening in front. Instead, I try to think a bigger picture. I also realize how immature I was back then, and when I try to think before I react, my heart feels calmer than before, and I discover many unexpected good ways will come to me! - It's your life so why waste on someone / something which doesn't make you happy? If you're not happy with your life, who would make you feel to? 3. There's nothing wrong to do something that makes you happy! - Make sure you know what is your priority in life. - If you don't, who would love you? - Like I just say, life is short. If this thing doesn't affect your family / health / career, there's nothing to gaga over about it. 6. Sometimes, SHADDAP is way better than do the talking. - Think before you speak! 7. What happens in the past will enrich your future! - I may have a horrible past 2 years but it had taught me a very valuable lesson, and also moulded me into a better person. I must say, I've grown up alot in 2015! 8. God, family & health are the most important thing in your life! - If you can't manage it, it's hard to concentrate / manage other stuff! - It's not how many friends you know matters, but those who treats you sincerely. Who cares about those who hurts you badly? Kick 'em out, girl! - May all glory be to God! 11. While you're able, just do it! Which is why, I still think it's a need to have resolution to kick-start your brand new year. At least, when you fall apart, there's something you can refer back to, to refresh your mind upon why are you starting this. I've been running away from it for quite sometimes and I think it's time for me to contribute some. ~ Excel in my career. Now I'm all well & prepared, it's time to shine with God! ~ Be more active in blogging. One thing I realize the reason why my blog has not been generating good hits is my non-aggressiveness attitude. Looking at how other bloggers had performed, took their blog very seriously despite it's just their past time, I must say I've been treating this site like when I've the mood, I come, that kind of feeling. 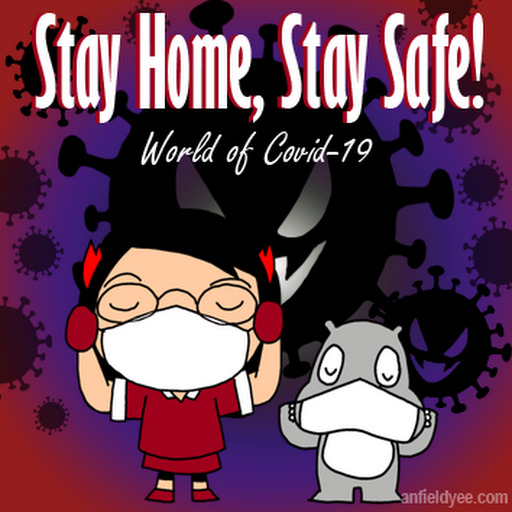 A post can easily posted up within a day, but it took me FOREVER to come out a blogpost. No wonder my life blog is so boring. With 5 pending blogpost accumated since October 2015 in my hand, I guess I owe lots of readers & client an apology. This time, I'm determine to treat my blog seriously! So give me another chance, and I'll try to clear it up by end of this month. I think I've been keep making this wish every year, not since I've gone through what's feels like to fall sick. Yes God, I need your healing power. I will watch my diet & activity, all I need is your miraculous work. ►Excel in my career path. ►Produce more funny and interesting comic blogpost. After all, this is my main reason to blog! I'm not done with my travel bug!!! Thank you, 2015, for the memories! Despite with the ups and downs you've given me, you've been treating me good. I've learned a lot about myself and I promise to become a better person in 2016! Last but not least, I wish all of you here, who manage to read until this line: May your wishes come true in 2016. Happy New Year!!! Have you made your wishes under the firework? By the way, what do you think about my bilingual comic? Will it be better than just having English version? Your comment please. I dislike CNY too. Just feel BZ BZ & BZ. Dear, I'm so happy to meet you in my first food review. 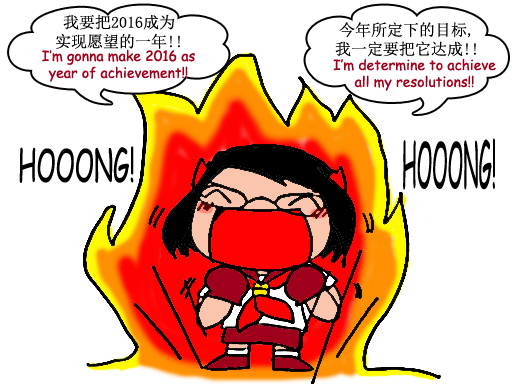 Hope you achieve all your new year resolution. I have updated your fan that you start blogging in bilingual. Keep it up! You have our supports! 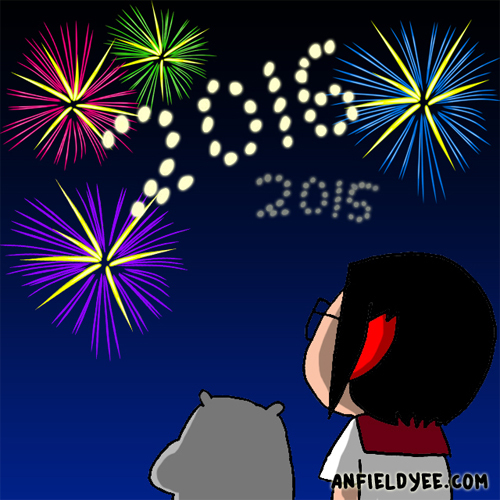 Happy New Year Sin yee! may your wish come true! Love the comic strips! And happy new year to you! Happie New Year ya!anyway I love your drawing so cute! Your 2015 reflections are actually can be a good advice to others too. May 2016 don't just be just another year but another year wiser to us! Happy 20116! :D May all your wishes come true. Happy New Year girl! <3 Loved the fact that you reflected on your 2015 and promise to improve in 2016. Jia you! happy new year! i really like your posts. keep it up! and yes, be healthy is important. without healthy body, we can't do anything. Happy New Year to you. 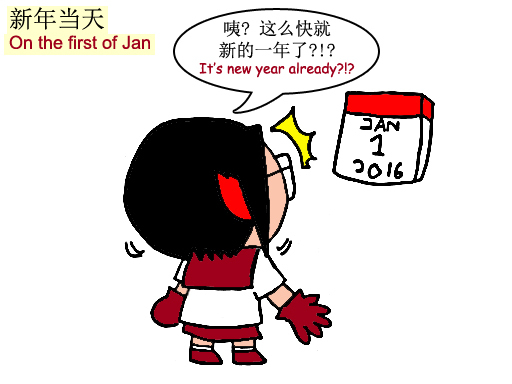 I never bother myself with Chinese New Year, and have done away with new Year's resolution since a long time ago. Just do my best every time, that's all that matters. Great that you had your new resolutions. Mine is to spend more times with my Little Angels. Happy New year sin Yee. keep it up and you can do it. Try to complete at list 3 of your resolution. We work hard together. Happy new year! Have a blast! Happy New Year Sin Yee! May all your resolution for 2016 came true! Happy new year! It's great what you've learnt last year. The fact that you've written down your goals for all of us to see is a big step to achieving your goals. Wishing you a wonderful year! I like the way you think, yes we must love ourselves before we can love or care for others. Plus don't get angry over small matters just waste our time & energy look at the bigger picture.